The brand-new Warm Springs BART station is officially open to passengers -- and is getting ready to welcome its first weekday commute crowd Monday. 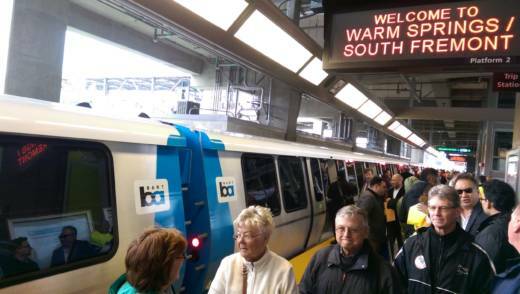 Trains began rolling Saturday, extending BART service to South Fremont. "This gets us that one step closer to the job center of the Bay Area," said BART board member Robert Raburn at a station-opening event Friday. He said the combination of Warm Springs and BART's 10-mile extension into Santa Clara County -- scheduled to open late this year, with stops in Milpitas and San Jose's Berryessa neighborhood -- will create new opportunities for those going to and from work in Silicon Valley. "I think it will open up a reverse commute that we haven't seen before at BART," Raburn said. The Warm Springs station comes with over 2,000 parking spots, including 42 solar-powered stations for charging electric vehicles. From the platform, you can see the giant building housing Tesla's electric-car plant -- and not a lot else. But Fremont Mayor Lily Mei views the landscape a little differently. "What we're seeing is a field of dreams for us," Mei said Friday. The city envisions 4,000 housing units in the Warm Springs area and sees future employers adding 20,000 new jobs near the station. Friday's ceremony was attended by a mostly happy crowd that came out in the midst of rainy, blustery weather to admire the station's design -- including an art-glass entrance rotunda. One concern came from Lisamaria Martinez, who is blind. She said that a feature intended to help the sight-impaired, a raised yellow tactile strip running through the station, is not useful for navigation. "I don't know where the strip is taking me," Martinez said. "Is it taking me to the parking station? Is a ticket booth? When I use my ears and listen to the noises around me, I get so much information and can directly go where I need to go, instead of having these little strips assume I need to go somewhere." The tactile strips also bothered El Cerrito Mayor Janet Abelson. She uses a motorized scooter, and said those strips can be difficult to drive over. However, she appreciates the station is equipped with two elevators. "If one of them is out of service, I can still get in," Abelson said. BART broke ground on the Warm Springs extension, which runs 5.4 miles from central Fremont, in 2009 and originally planned to open it in late 2014. That date moved back several times. The need to replace electrical power equipment all the way north to Hayward caused one major delay. More recently, difficulties getting the agency's old train control computer to communicate with the extension's new data and communications equipment postponed the start of service. BART concedes the opening came well behind schedule, but says the project was completed more than $100 million under its original $890 million budget. Fremont has been the southern terminus for East Bay BART trains since the system's opening in 1972. Now -- get used to boarding a train bound for Warm Springs/South Fremont.